Vendido y enviado por SHENGLUO. Precio: EUR 6,39 Envío GRATIS. 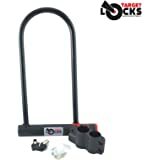 Grillete en D Target Locks® resistente para bicicletas de alta seguridad, apto para marcos de bicicletas normales y grandes con una construcción de metal resistente de alta calidad, incluye soporte y es ideal para la seguridad de la mayoría de las bicicletas, motocicletas 2 llaves. Product Description Widely used on motorbike, bike, bicycle, e-bike, scooter or other small vehicles. Come with two keys for convenient use, you can take one and another for spare use. Plastic covered metal body, this cable lock is safety to use for the protecting of your vehicle. The locks arrived covered in fine dust/dirt, and so I had to wash them off before using them. The paint on the lock portion was poorly applied and scratched all over. The stickers were crinkled and falling off the locks. The keys were poorly cast and have sharp plastic bits that stick out. Also, the rubber coated U-loop feels tacky and I am afraid that the plastic may be failing. However, the locks do function adequately for securing a pair of cupboards in my office, and the key for each lock is unique. I had ordered these locks because they were the only size that would work with my cupboards. I will be keeping them, but with reservations. 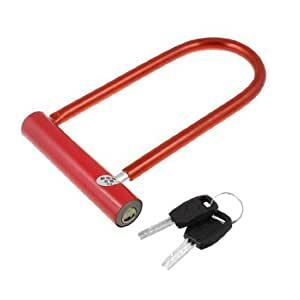 It's totally too small as a bike lock. It's supposed to lock the bike frame, but it can only lock a wheel.